And so we’re off to Sweden next year! What a great result for them, and for the rather charming Måns Zelmerlöw. Sweden have finished in the top three four times in the last five years, and won it twice in that time. Their victory last night means that Sweden is now outright the second most successful country at the Eurovision Song Contest, with six wins. They also overtake the UK, France and Luxembourg, each of whom have five wins. I wouldn’t think it would be that long until Sweden overtake Ireland’s current record of seven. 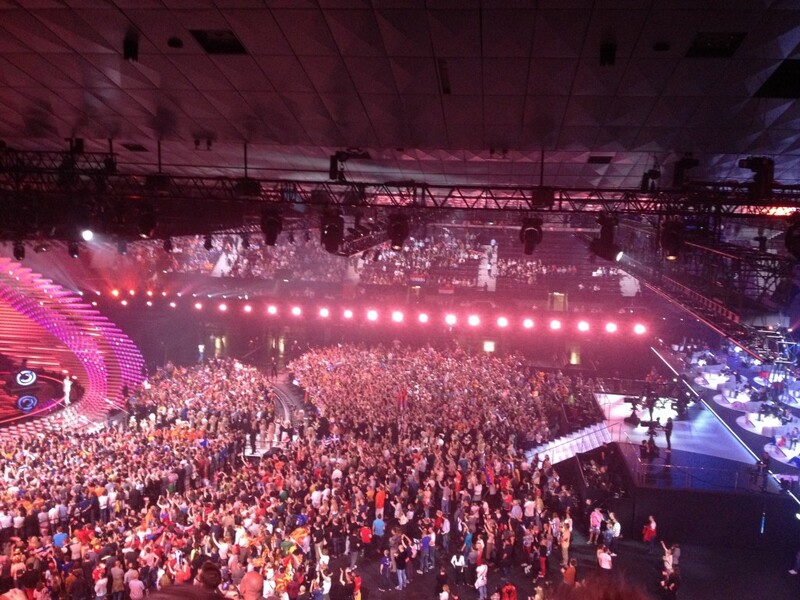 Much of the Swedes success at Eurovision is due to their selection process – the highly popular Melodifestivalen. At home it is the biggest television show of the year (even beating Eurovision), and streamed around the world it has a huge following. 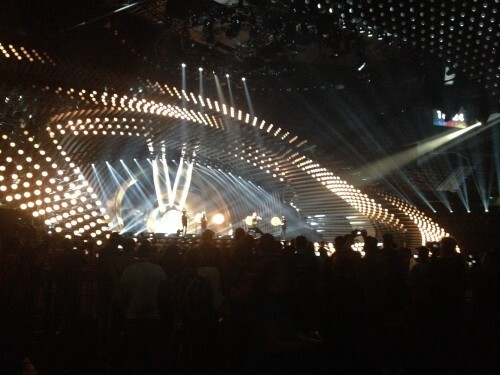 Each year, over the course of six weeks, 28 songs compete to make it to the final in Stockholm. 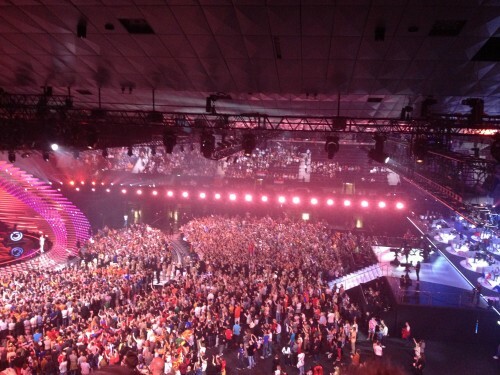 I have been a fan of the contest for over a decade now, and for the past three years I have travelled to Stockholm for the weekend of the Melodifestivalen final, with my good friends Rachel and Brian. By then the songs are well known to us, and it was rather easy for us to predict that Måns would win with “Heroes” this year, and also Eurovision. What was good about it is that is was a familiar sounding song, with awesome presentation for you guys watching at home (close-up shots of him interacting with the anmation), and also wide shots of everyone going bonkers in the arena. Genius! The fact that the Swedes continue to send highly competitive and highly popular songs is due to their quality, and appeal. The Melodifestivalen producers are very good at quality control, and what’s great is that there is always a musical style to complement the varied tastes of the Swedish public (in the first instance). Quality control of the music, and a great television spectacle ensures that the songs are good and presented well. Also, the winner is determined via an international sweep of 12 countries and also the Swedish televote, which ensures that the winning song is almost guaranteed international appeal. That’s how you select a winner, and surely the BBC at some point needs to change their failed formula. It really is becoming a national embarrassment. Sure, Electro Velvet got a great reaction in the arena, and they seem like nice people, but clearly the music is not good enough and that’s a major disappointment for us all. 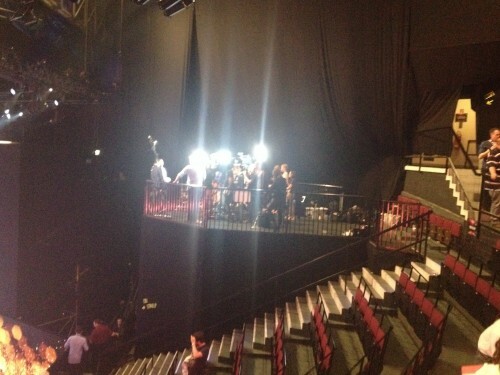 Something needs to change, but please god that Simon Cowell doesn’t ever get his hands on it! 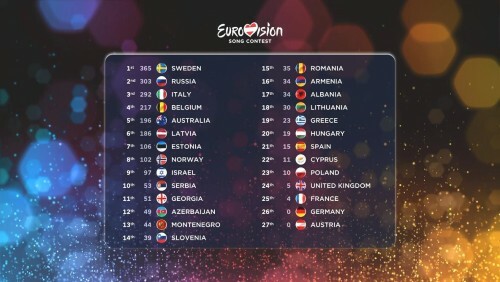 Did you know that the EBU use an algorithm to determine in which order the results are called? This ensures that votes can be reported by the national juries in a way which builds momentum for the audience, and also tension for us too! It sure worked! Only after twenty something countries did Sweden leapfrog Russia to take an unassailable lead. 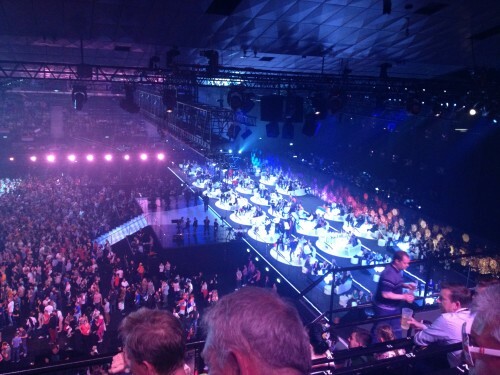 I’m not sure what the audio levels for the live sound were like at home, but the roar from the arena when Måns took the lead was incredible – as much of a roar as I have ever heard (and on a par with Conchita’s performance in the semi-finals last year). I would also be interested to see (hear) how the rather loud booing, aimed at the neighbourly votes for Russia, was heard? Let me be clear, there had been no booing throughout the week for any performance of “A Million Voices”, so it was highly distasteful and ignorant really for it to be the case last night. I was a bit embarrassed to be in a venue and guilty by association. The interventions by the presenters to remind us of that we were supposed to be ‘building bridges’, twice, showed their indignation for the boos (did you see how peeved Conchita looked!). That said, the simmering hostilities about neighbourly voting seemed heightened last night. You might say how else could Sweden have won, but their points came from a wider pool than just their neighbours – they got points from every single country. And actually, in a quite shocking departure from neighbourly voting, neither Cyprus nor Greece gave each other the douze points for the first time in years. 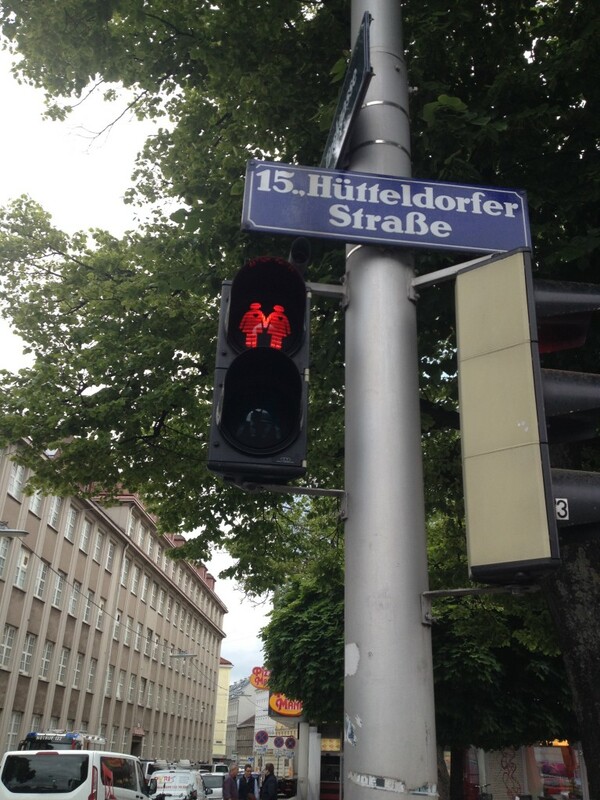 I hope you have enjoyed reading my blog this week, and tracking my moves in Vienna. I’ve had a lot of fun, not least with trying to think of blog post titles that either directly draw from, or allude to, songs from The Sound of Music. Not by chance, it’s also my favourite film! Any excuse! So, whilst the hills really have been alive with the sound of music this week, I will sign off for now. Watching the dress rehearsal of the final yesterday afternoon did become something of an endurance test. 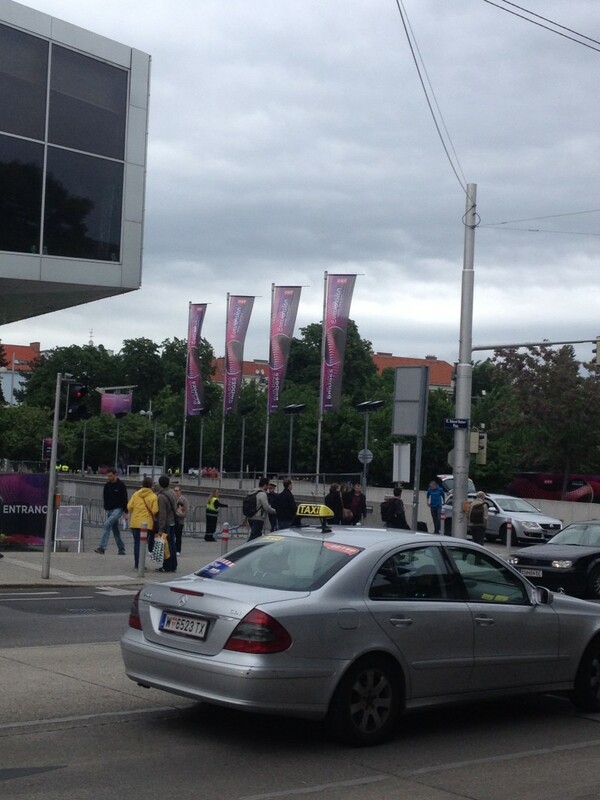 I had walked around Vienna for a couple of hours before going to the press centre, and ultimately the arena. Once again we were watching from the standing area in front of the stage, which was great fun. 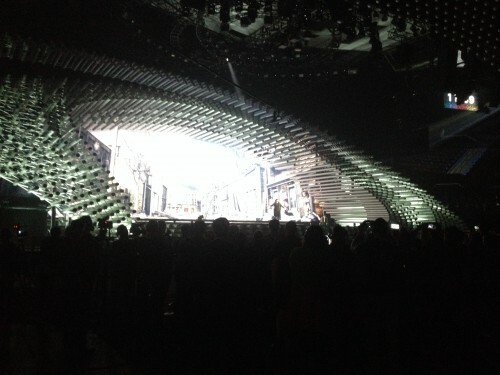 The only thing is, after watching the performances for a couple of hours I was feeling a little fatigued! Yeah, I’d been on my feet for about six hours, but also getting through 27 songs is a test of resilience! For those watching at home tonight, at least you can refresh your drinks/nibbles/put the bins out during the songs which may not exactly float you boat. For us there is that sense of having to endure songs which you find a bit bland/boring/cringe. I will be quite happy to never hear some of these songs again after tonight, but let’s stay on the positive side of things (or as Graham Norton would say, the left hand side of the scoreboard). As Europe decides tonight it is clear that there are a clutch of songs that will do well: Sweden, Russia, Italy, Australia, Estonia, Belgium, Norway amongst them. It might be a really close race, and what I like about the Grand Final in recent years is that most of the songs are really, really good. Yeah, some are a bit naff and a bit cringe, and yep, this might be how the UK’s entry might be seen, but all in all, we all have a thoroughly entertaining evening ahead of us. There are a few things to look out for tonight: a wonderful opening sequence, with pre-recorded orchestra doing a “hooked on classics” kinda medley. Throw in some school kids, singing presenters and a flying Conchita, and you know that you’re in for an excellent evening! If that doesn’t stir your ardour for all things Eurovision, what will!? After that countdown tonight the arena, Europe and beyond, will get their Eurovision party started once again. 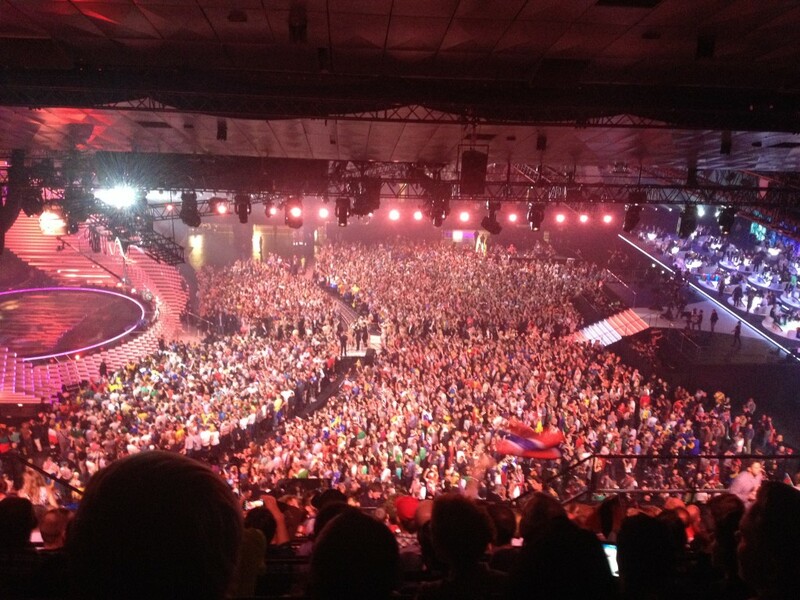 I was really disappointed that Malta didn’t make it into the final – but as I said in my review yesterday, it looked a bit too similar to Conchita’s staging last year. I was sitting next to a Maltese woman, and she looked in shock at their departure, poor thing. 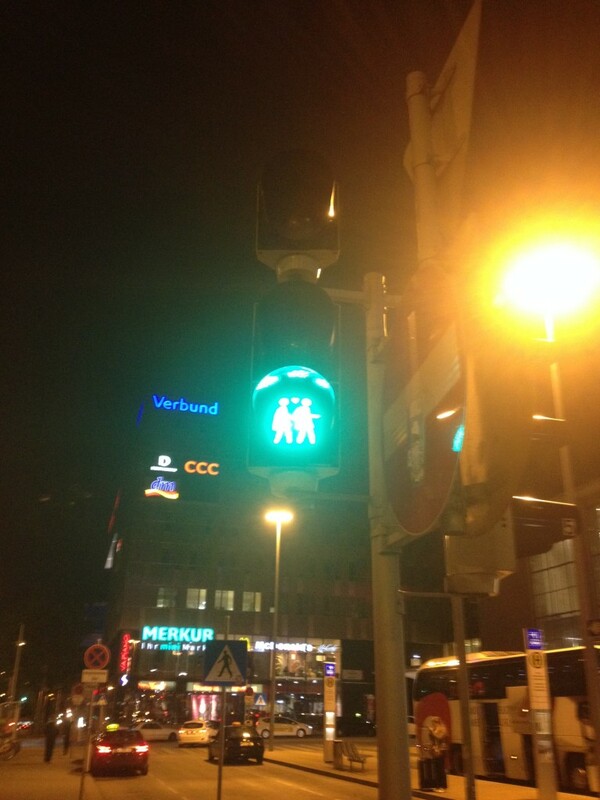 With that in mind, you know that we are all about inclusivity here in the euro-bubble. And it goes without saying that all you reading are too. 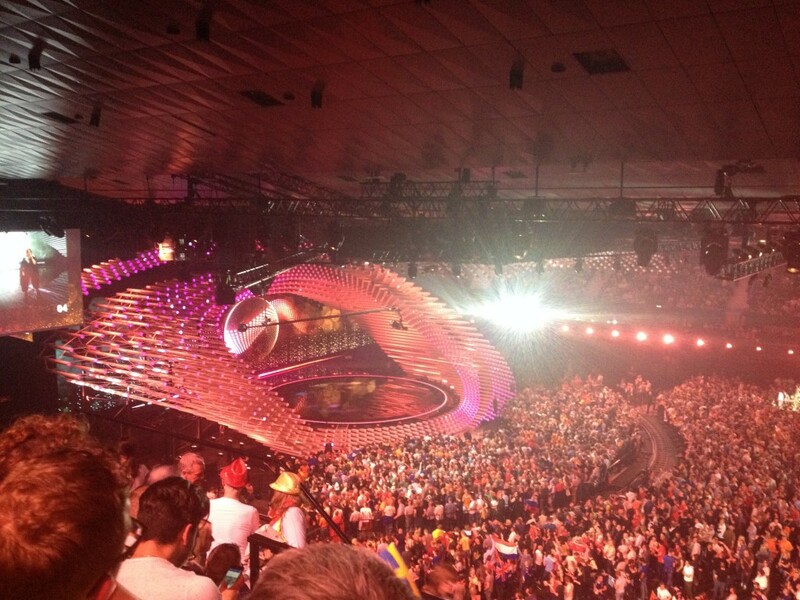 Something special happened when Conchita won the ESC last year, and it did bring to the forefront some interesting and much needed dialogues about tolerance and acceptance within Europe – particularly in relation to LGBT issues and human rights. As I said in a post recently, clearly the significance of her victory last year still resonates, in terms of human rights and LGBT issues. Indeed, at a meeting with Ban Ki-moon last year, he commented that her Eurovision victory really does send a “powerful message” for the promotion of respect for diversity. 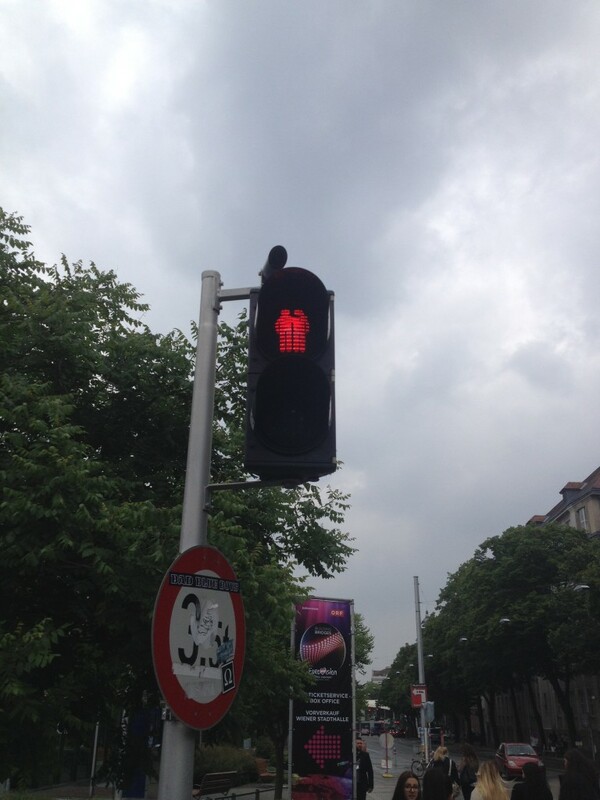 Some gestures matter more than words, and one of the most ingenious ways of reflecting tolerance and acceptance is on the streets of Vienna this week. Literally – on the streets. On Tuesday night we saw sixteen songs compete to get through to the grand final of ESC2015. Tonight seventeen will battle it out to be one of the ten songs making it to Saturday night. 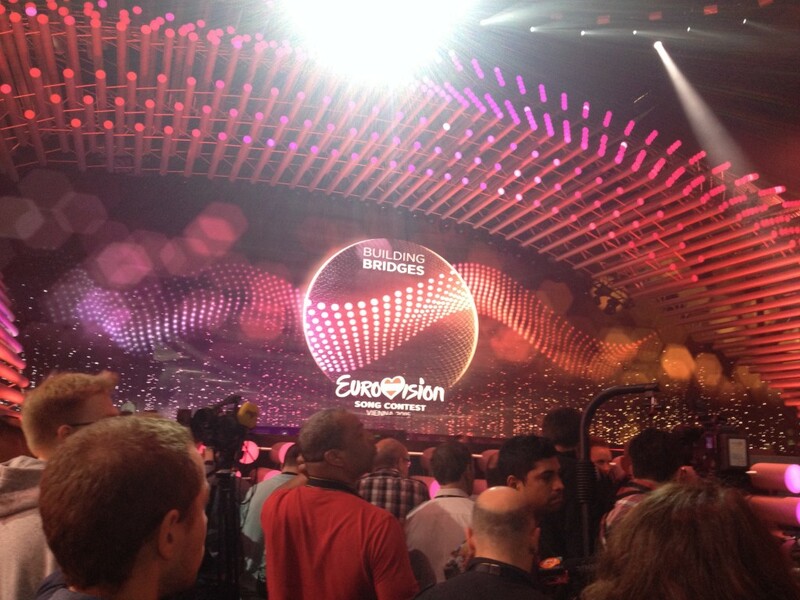 Yesterday I sat through the dress rehearsal in the arena, ahead of the second semi-final tonight on BBC3 at 8pm. And, ever the glutton for punishment, I watched it again today in the press centre, to see it on the big screen! 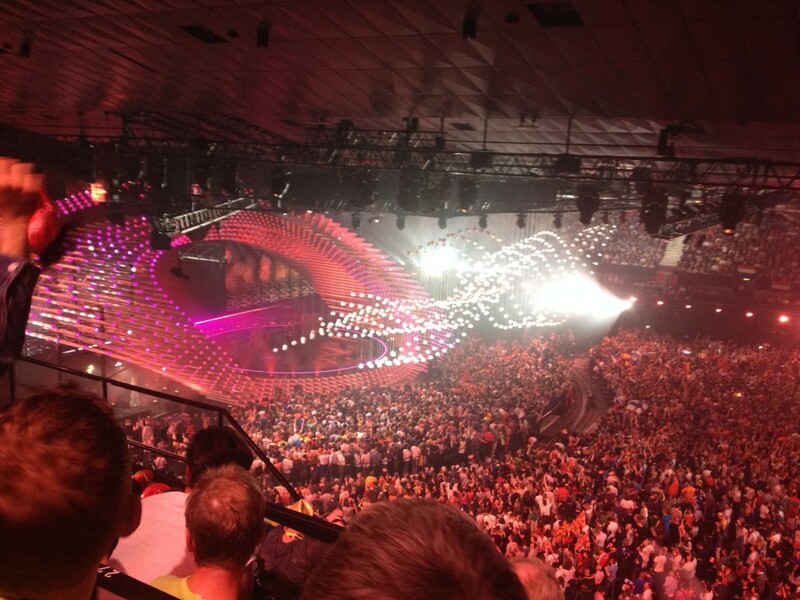 Last year we sent a Molly to Eurovision, and this year Ireland have! I like this song. I get shades of Tori Amos, and it’s a very accomplished song from seventeen year old singer-songwriter Molly. She seems to have grown in confidence on camera, and I really hope that it goes through. One of my pre-contest favourites. It keeps getting a great reaction from the audience, and again it is visually very strong. 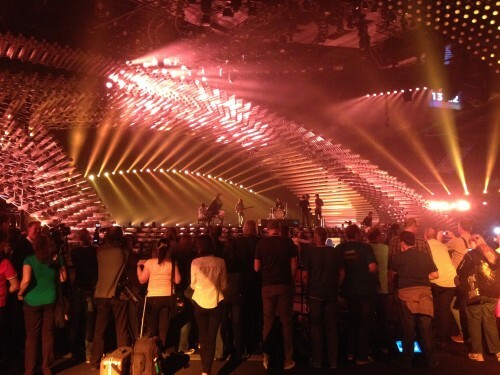 You might find the backdrop a little too similar to Conchita’s last year, but flames aside I hope it doesn’t crash and burn tonight. Poor thing. Leonor Andrade is the bookies favourite to come last, in a tussle with San Marino. You can kinda see why. Seems to lack a good hook, but Claudia Winkleman fans will be happy! If you like a bit of scruff (man with a beard) then this is probably your winner. Yet another duet, this time from Marta and Václav. There is poll here for “Eurovision’s next top male model” and you’ve guessed it – Václav is in the mix! There’s good chemistry from this pair, with tempestuous Marta throwing her shoes aside as the track reaches its peak. 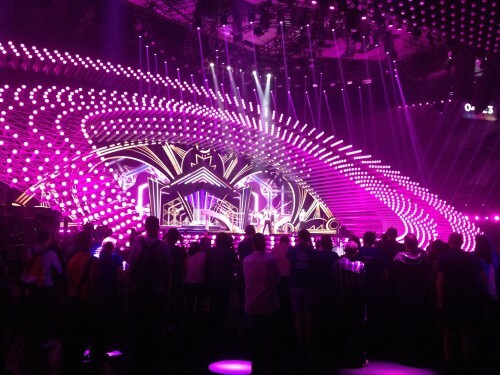 It certainly is a case of the battle for Eurovision’s top duet in this semi-final – will this make it through? Aminata has one of the best vision-mixed songs on the screen tonight. Her song is contemporary, with another powerful vocal. You might find it a bit shouty. That said, great mix of visuals and vocals. It’s always a bit tricky when a song title is a bit prophetic. Remember, the UK sent Nicki French to ESC 2000 with ”Don’t Play That Song Again”. Guess what – Europe didn’t! The Swiss entry this year is “Time To Shine”, but will it shine brightly enough tonight? There are a few songs which give me that ‘euro-tingle’, and this is one of them. 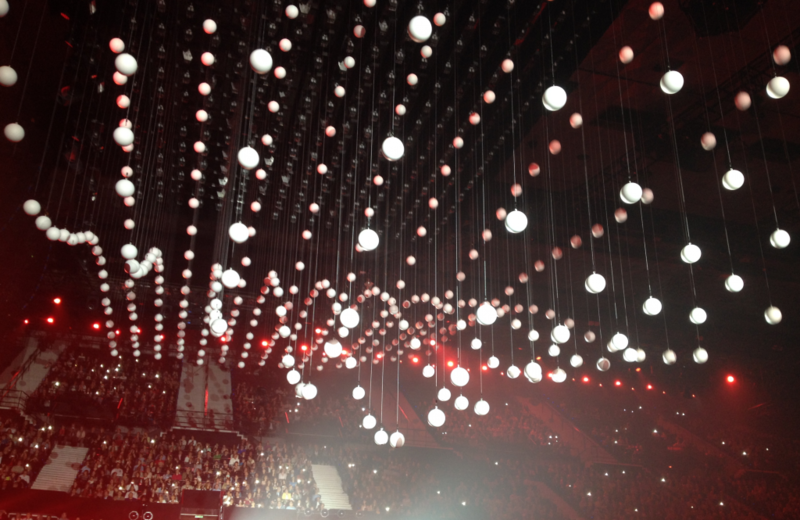 A beautiful song, with a beautiful visual – all enhanced with audience participation and a sea of mobile phone torches. Should be popular with the juries, and I really hope with the public too – deserves to go through. A nice effort from Poland, and for those in the mood for a gentle ballad it will be of interest. Not as full-throttle as many of the ballads, so it might do well. Well we were up and at ‘em first thing today, arriving at the arena for the second rehearsal of the ‘big seven’ – expanded this year to include guest country Australia. I haven’t seen any of the previous rehearsals, so it was good to finally be in the arena in the standing area at the front, to see the artists do their thing. Next up, Edurne for Spain. So much more than a frock and a wind machine for their staging of “Amanecer”. The song has flourishes of Madonna’s “Frozen” throughout, and is suitably epic. In the final this and Russia may count each other out slightly, but Edurne’s not giving up without a fight! Indeed, there is a rather interesting frock which will be discarded at some point in the proceedings, as will the male backing dancer’s top! It’s all very passionate, and there is an impressive section where Edurne is flung around by the backing dancer, and yet somehow her vocal remains impeccable! She’s got a strong core for sure! I hope it does well. Spain have found their niche in previous years, and songs and performances such as this have proved popular. France is increasingly fancied in the press centre, and with the bookies. I think a bit of it is the effect of the euro-bubble. I’m not sure it will do as well as some expect. That said, the staging is visually very strong and Lisa Angell has a great set of pipes. What was great about her time on stage today was that, a) she only did a run-through twice (with most other countries doing three or four during their twenty minute slot), and b) she thanked all the technical staff for making her feel wonderful. Such generosity of spirit in a field of divas was probably very well received by the technical team. Ann Sophie, representing Germany, was the surprise ticket for her home country. The original artist who was selected by the German public changed his mind on hearing that he had won, and so a slightly bemused Ann Sophie took his place. This was a very slick rehearsal, and she does a cracking vocal and confidently sashaying on stage. The backing singers are supporting her with great harmonies, and “Black Smoke” is a catchy pop song. I hope that Ann Sophie’s confident performance wins over the viewing public and national juries. Australia have been invited to take part this year, as part of the 60th anniversary celebrations. As you might know, the ESC is hugely popular down under, and every year it is broadcast ‘as live’ the following evening in Australia – they even televote for their own amusement! This year they are active participants, and popular with the bookies. It’s a good song, and Guy Sebastian is another fine vocalist. Reminiscent for me of Denmark’s Bruno Marrs sound-alike, Basim. It’ll do well, but I really hope it doesn’t win, as I don’t really like the gimmick. In the event that they do win, originally I was led to believe that the country that finishes as runner-up would host next year. Now I understand that it will be held in Germany. And, finally the United Kingdom were also on stage today. Electro Velvet did four performances, and got more polished with each turn. I gotta say that I don’t think that it’s our worst ever UK entry, as some have suggested. I think Josh Dubovie in 2010 was much worse, and Daz Sampson in 2006 was total cringe, and don’t get me started on Scooch in 2007! I do like listening to the song in the car, in the office, etc. It’s got as few good hooks, for me – if somewhat bizarre lyrics. However, (repeating a phrase I have used all week), the staging is a bit of a hot mess. Yes, do the flapping and retro stuff, but don’t wrap it up with sparkly, flashing neon frocks. It’s all a bit too fussy. To repeat, I really like the song – my Dad even thinks that it’s going to win – but my hunch is that this package (song and performance) might cause it to fall flat, and unfortunately struggle out of the bottom five in the final. I am ever the optimist, as you know, but I haven’t emailed John Cater this week to set a bet that it will get into the top ten. And I’m not even going to do a Paddy Ashdown either way (top or bottom). Still, time for some tweaks, so let’s see, and remain ever hopeful that the performers are not made to feel like a national embarrassment – because they do deserve better than that. 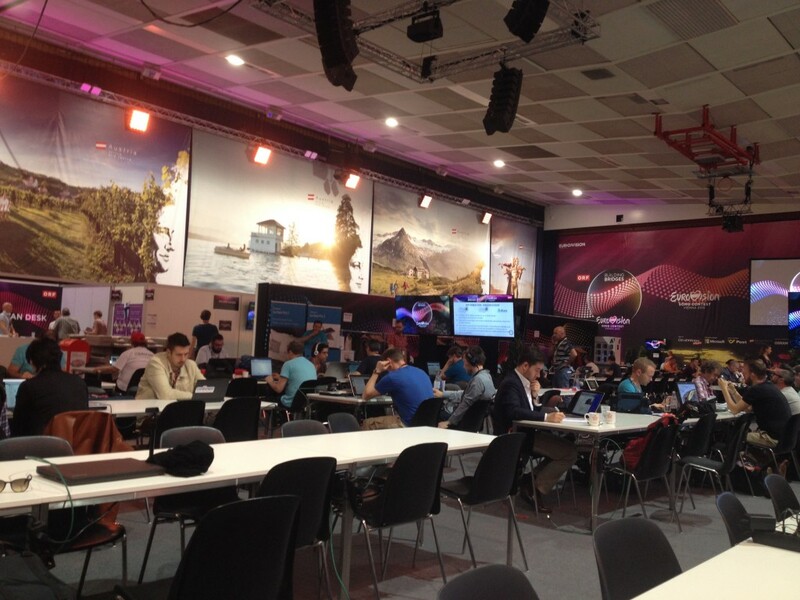 I have spent most of the last two days in the arena and press centre. I haven’t really had a chance to explore this lovely city yet. That will come in the days ahead, and I know that there has been a lot going on in the euro-bubble. I know that I feel like I’ve been making up for arriving slighly late on Monday – and that I’m all caught-up now (literally!). 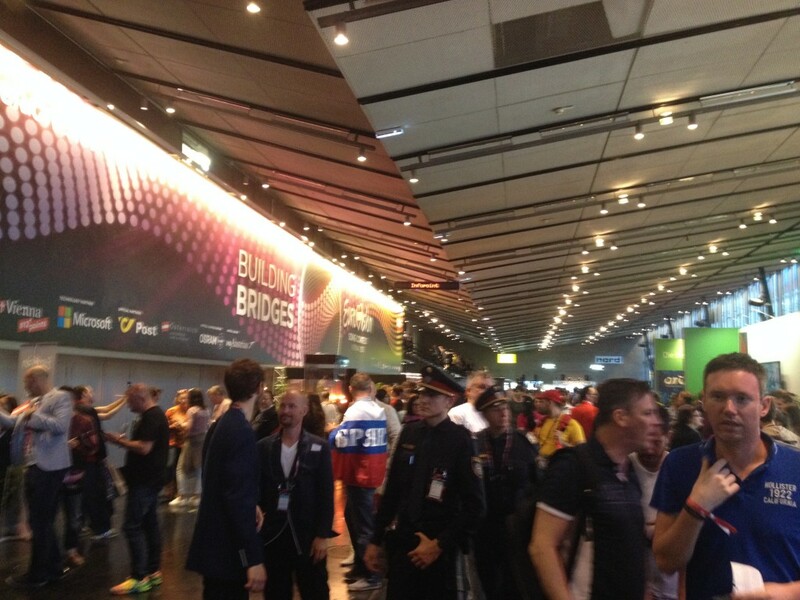 It took less than twenty minutes to get back to our hotel, which was a relief as it would be an early start for us on Wednesday morning, as the ‘Big 7″ take to the stage for their second rehearsal slots. Like I said, at this point I really am von-trapped with all the cool stuff happening in and around the arena… and I’m loving it! Once again your English/Irish posse have put their heads together to determine our choices for who is going through, and who is going home. Here are the results of the ‘all kinds of everything’ commentators from here in downtown Vienna. See if you agree, because, in a departure this year, Brian and I do not! Ok, ahead of tonight here’s my thoughts on the dress rehearsal – see if anything has changed my mind. 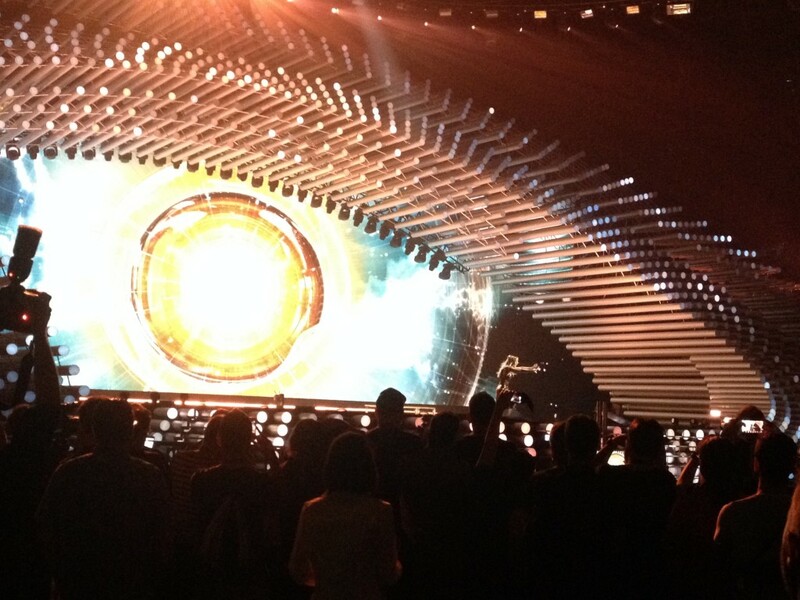 The opening sequence sees Conchita Wurst welcome us to the 2015 Eurovision Song Contest. An lengthy sequence will see all a participants parade through the arena. This is them metaphorically building a bridge between the artists’ green room at the back of the arena and the stage. 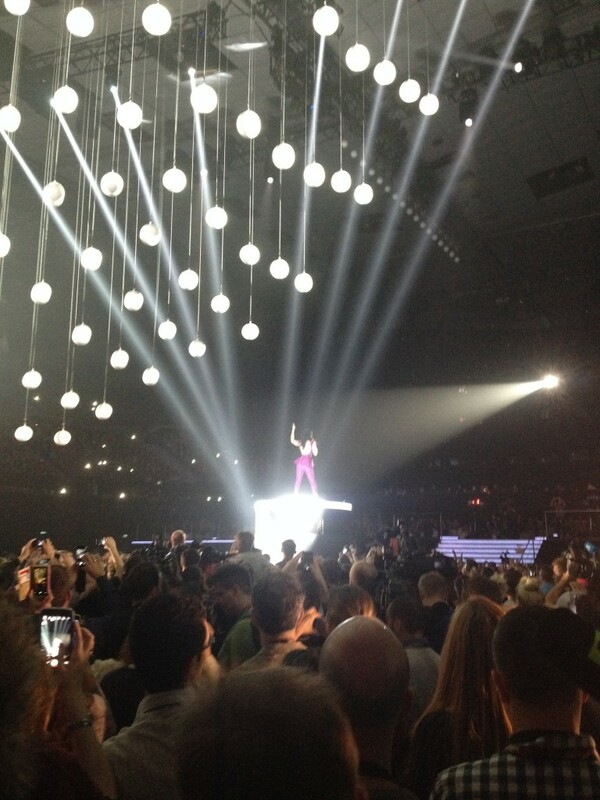 There is the (now) obligatory reprise of Rise Like A Phoenix, which gets a change of tempo and an extended performance. 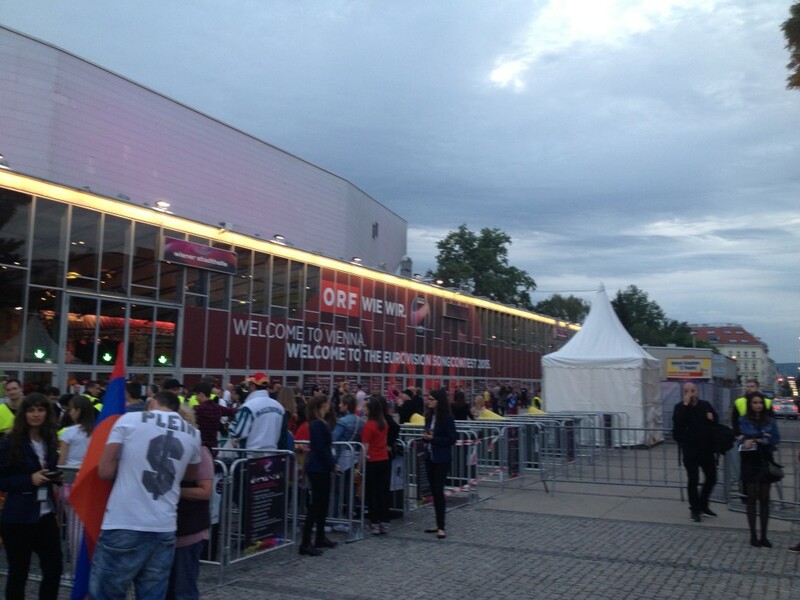 The arena looks stunning on the screen – can’t wait to see to tonight! The vocal was a bit pitchy. You will like how it is presented probably more than the song. Nice touch as the six vocalists stand on a map to literally mark their territory. Still a hot mess, can’t see it getting through. A great vocal from Loïc on this song, with some ‘interesting choreography. Mind you, you might want to avoid Loïc’s creepy stare in places! This one’s a sleeper, we think. Will do well – there aren’t really that many songs that might capture the younger audience. Some weird lighting and staging for this one. Poor Trijntje hasn’t exactly been well lit. I still like the song, not sure that the presentation adds anything to the song. I thought is was going through, not sure now! There is indeed a wind machine! And a pretty frock! I know my Eurovision. The best so far. 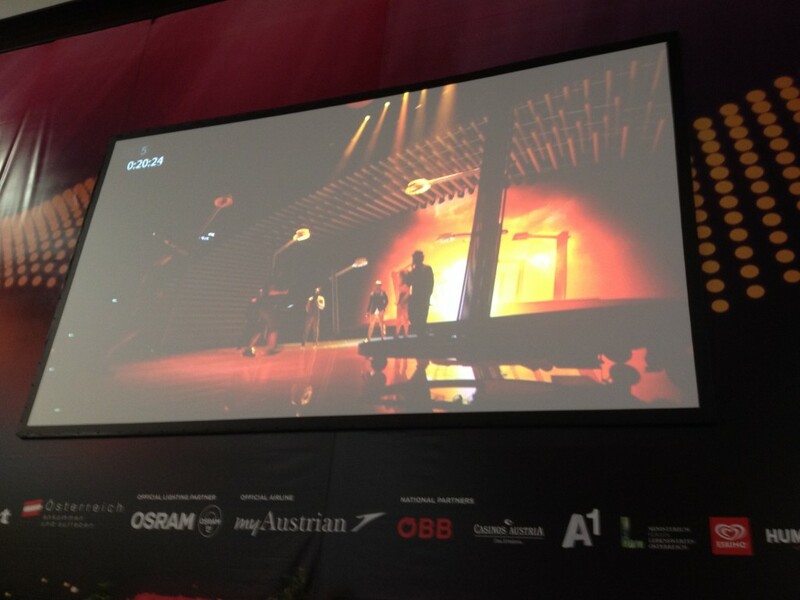 Sassy and confident staging – you will like the effect of the shadows on stage (not The shadows, their shadows rather!). If they don’t get too pitchy and flat this really will fly through. 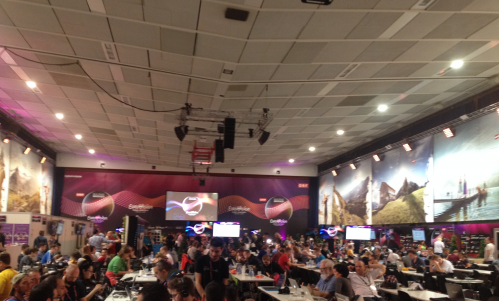 Great reaction in the press centre, judging by the applause the best so far! There are indeed autumn leaves falling in the background for the Macedonian entry. Daniel Kajmakoski is also ably assisted on backing vocals by what looks like Boyz II Men! It looks and sound goods. Like I said earlier, nothing much like it in this semi, so I think it’ll get through. Blimey. Serbian singer Bojana gives it some welly! It’s our first big-hands-in-the-air type of tune. 10 out of 10 for effort, but perhaps it’s all a bit too much, with masks flying and vecro ripping outfits… Click here to watch. Some nice visuals and good effort on the presentation. Finishes nicely, but somewhere in the middle my mind starts to wander. Click here to watch. As I said yesterday, it’s hard not to be cynical about the sentiment of the song. It’ll be the Marmite song (perhaps with Finland) – love it, or hate it. Love it because the song is actually really, really good, or hate it because of what happens beyond the fringes of the contest. For some it’s a case of oil and water – and the mix can’t work. For me it’s a case of Marmite. I like Marmite. The staging is as dynamic as the song – it looks great on telly. Good energy and familiar (and cool) vibes will see this through – and again, there are very few songs such as this will to appeal to the younger audience. Reminds me of the song “Apricot Stone” from Oslo in 2010 – but at a slower tempo. Might be one for you to refresh your drink and top-up the snacks! Nice, but nice doesn’t win Eurovision. Good vocals. Performance is a bit static, but the camera angles and backdrop visuals add a poignancy to the performance. I think is going through, Ruxandra! I think it’s going to be a great show. Looks amazing on the telly – should look even better in the arena (although we do lose some of the intimacy of the television presentation. 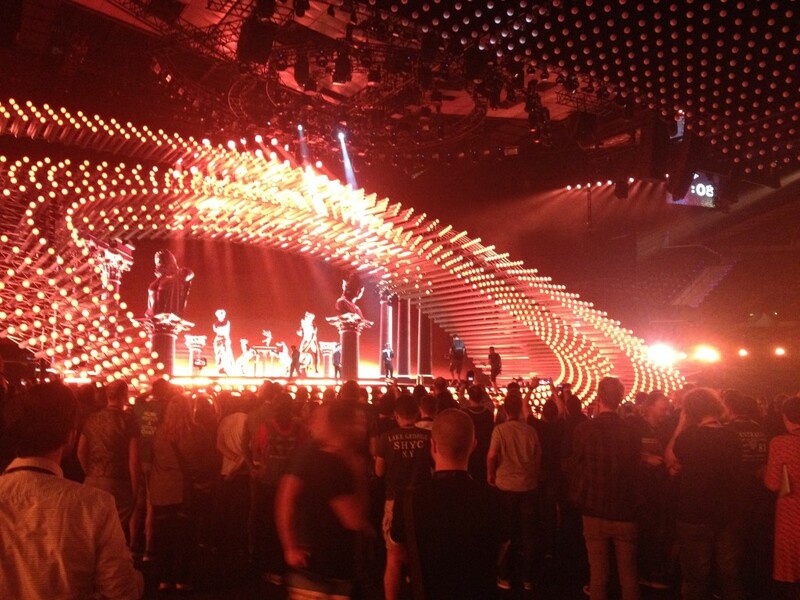 Stunning stage design and lighting and visual effects will have you hooked. It’s a very sunny Tuesday here in Vienna, with temperatures at the moment in the mid-20s. I have finally made it to the arena, collected my accreditation and I am now in-situ with Prof Brian Singleton in the press centre. We won’t make it into the arena until tonight, but we will be watching the last dress rehearsal this afternoon on the large screen in the press centre. 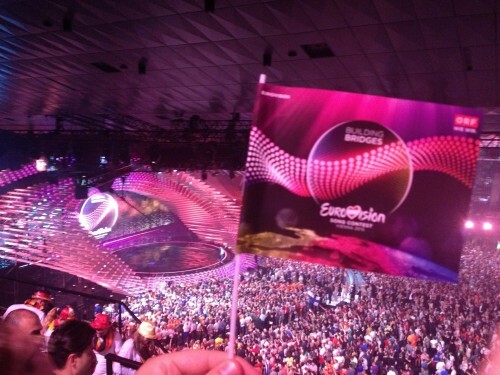 FYI, Brian will be tweeting throughout the contest representing our ERN (Eurovision Research Network) activities and opinions. Follow Brian @eurovisionern and retweet freely! We’re up and going as of now! It’s a roomy and cool press centre, and already there is a nice background buzz about the place. It seems busier than normal at this time of the week than in previous years. 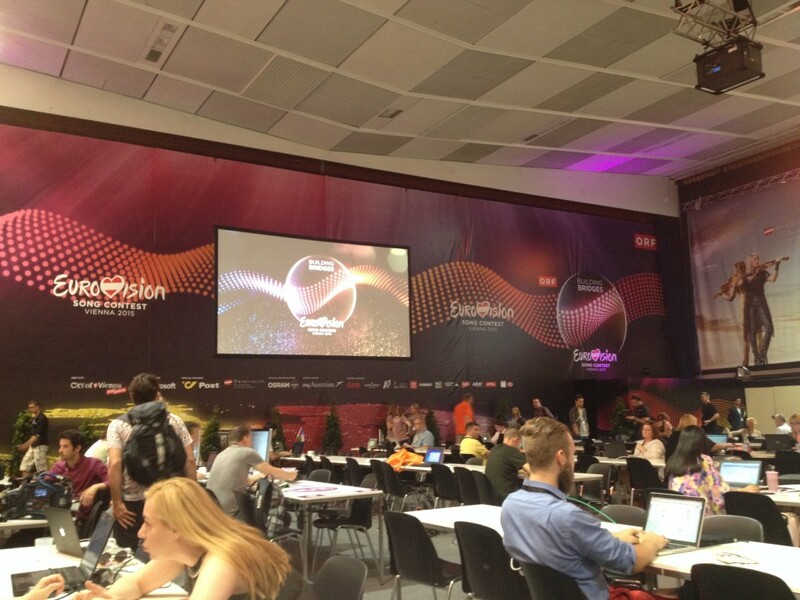 It is normally on the Thursday of the second-semi that the press centre gets really busy. It’s going to be a comfortable place to report from this week. 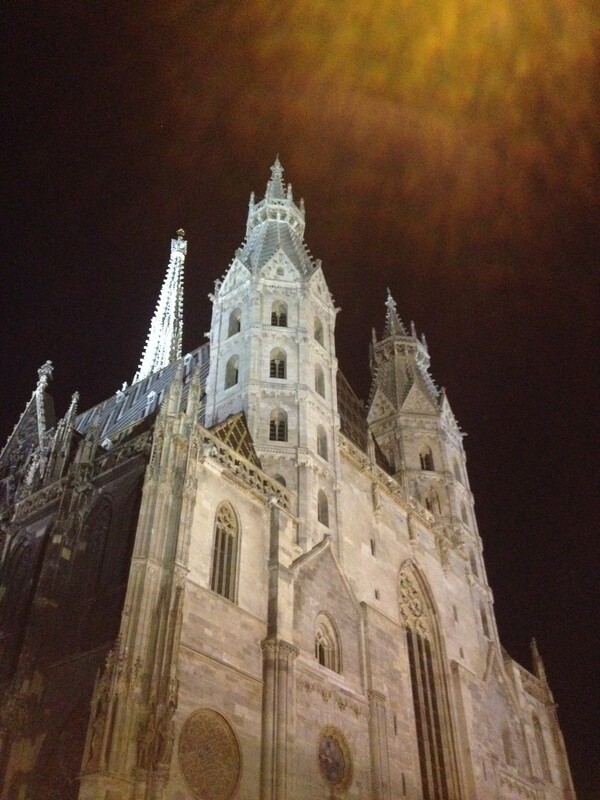 A photo from our excursion into town last night of the cathedral, below. Beautiful building, and I’ll get more of a feel of the city and post more pics throughout the week. How difficult can it be to get from departure point A (Southport), to destination B (Vienna). Erm, well extremely, as it happens! Prior to departure I had a frustrating Sunday afternoon trying to check-in online via the Brussels Airlines website. I cannot recommend their user interface! After a little bit of user error on my part I successfully managed to check-in for my connecting flight from Manchester to Brussels. Sorted. 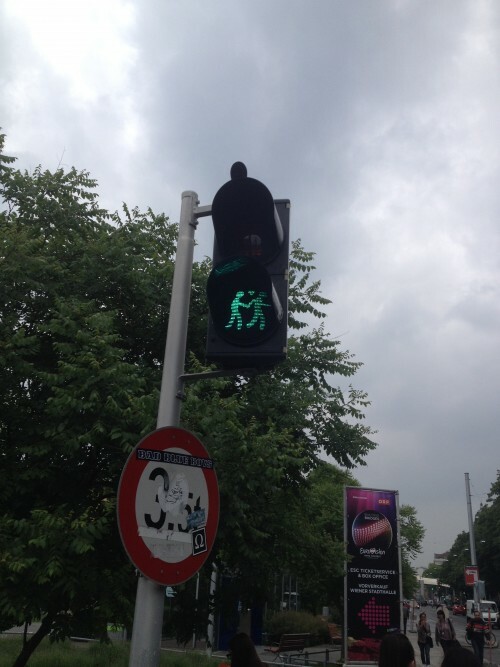 However, could I then book to get from Brussels to Vienna – no! Arriving at Manchester airport yesterday the problem was solved – I got the boarding card for Brussels to Vienna at regular check-in desk – simples! I thought that was me done with worrying about travel arrangements for the day. Erm, no! I then had to get through Brussels Airport to my connecting flight. International connecting flights are usually quite straightforward to navigate, aren’t they. 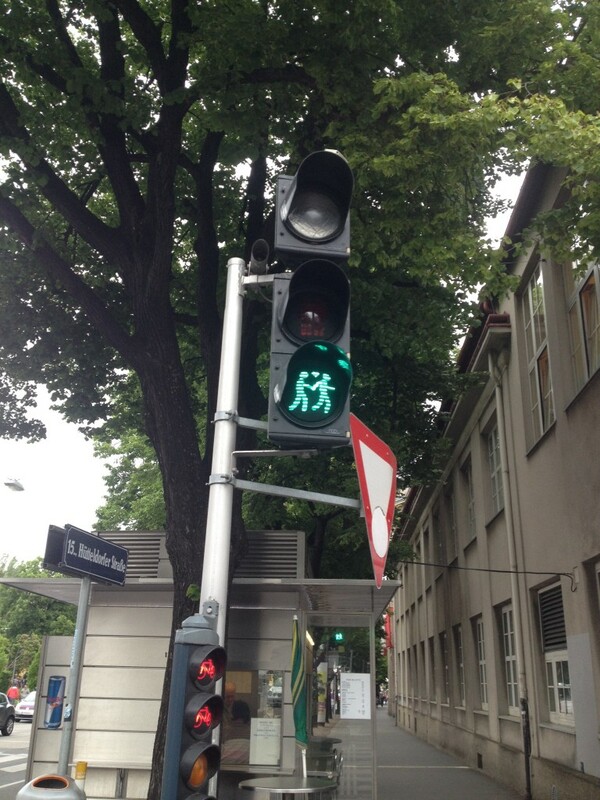 Erm, no – not here. With a window of just over 70 minutes to get from the plane to the gate there was a rather long wait for the bus taking us from the plane to the terminal, and then I was greeted by one of those queues that you see when you go to amusement parks like Alton Towers. You know the drill: you turn the corner expecting to see the Oblivion ride, for example, only to be faced with hundreds of people standing as far as the eye can see in front of you. Not what you need when you have such a short transfer window! Many people, myself included, were slightly bemused when staff wearing ‘Happy To Help’ t-shirts told us that there was no queue jumping allowed, even if you have a 70 minute transfer window. Absolutely shocking! Well, you might have guessed how it played out – and yup, it doesn’t end well. Eventually made it to the gate – but too late. This is a first for me – I have never missed a flight before. I’d probably be feeling a little more chilled about that but I was meeting my good friend Professor Brian Singleton at Vienna airport to catch our taxi to the hotel. 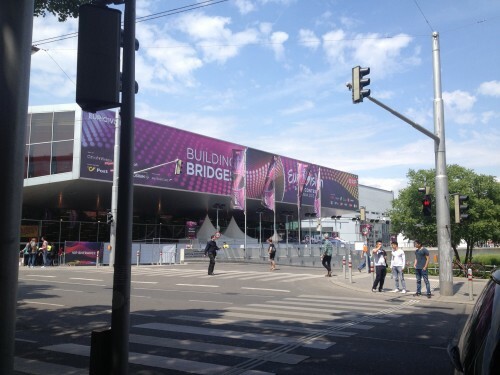 It was also the plan for us to get to the arena for the first dress rehearsal of the first semi-final. Well, that didn’t happen! A five-hour layover in Brussels airport, saw me will eventually get me into Vienna about 5.30pm local time. The hotel is comfy and I have a balcony! We are not staying in the centre of Austria, rather on the outskirts and quite near to the arena – which will be a bonus on the three evenings this week we will be there. Getting into the city is easy thanks to great subway links. We did venture out last night for dinner, which we had near to the Cathedral. So, a long day for me yesterday, and unfortunately my friends, I have no pics from the arena and the first dress rehearsal. What I have done is to review the runners and riders for the first semi-final, which you can watch tonight (Tuesday) on BBC3 at 8pm. As I said during my panel at the recent 60th Anniversary Conference for Eurovision held at Bafta a few weeks back, familiarity breeds popularity. We warm to some songs more quickly than others because we’ve heard it before, even though we haven’t (if you see what I mean!). This means that, once again this year, there are songs that have a whiff of other well known songs. For some it will be a bonus, but for others it might be a case of ‘heard it all before, don’t want to hear it again’ (you might remember the German entry from 2013, “Glorious” sounded a bit too similar to the previous winning song in 2012, “Euphoria” – it sank without a trace). You will find our first song of 2015 rather familiar. Think Liberty X and their song “Just A Little”, and you’ll be bob on. It’s an up-tempo song, not a bad start. Armenia had a top five finish last year, and they might have been hoping to repeat that success in 2015. I can’t see it happening. In fact, I think it’s a hot mess! Nice idea to bring the six singers together from five different continents, but I just can’t warm to the track. Like a few songs this year, it’s a bit of a mash-up of different styles. Sadly it doesn’t work for me. Ok, bad experience in Belgium’s main airport today, but that said, this is a really good song. You will like the quirky performance style of our man Loïc Nottet, but the song is catchy and should do well for Belgium. I think it sounds a bit like Lorde’s “Royals”. One of the more contemporary songs on offer this year, and it should get to the final. I’ll have a consonant, consonant, vowel, consonant, consonant, consonant, consonant, vowel, consonant – please. And that should give us the name of our Dutch singer, Trijntje! She’s singing a laid-back mid-tempo song, with a few ‘new country’ shades in the mix. It’s an easy listen, and catchy – partly because of the repeated lyric “why-why-i-i-i, why-i-i-I”. I hope it gets though. After a runners-up result last year with the fabulous Common Linnets, it would be good to see The Netherlands consolidate their good run of the past couple of years. This probably what you might consider an anti-Eurovision song. Finland has gone a bit punk on us, and with a track that doesn’t make ninety seconds. For some the fact that the bands are a group of musicians with down’s syndrome is a bit of interest. The betting odds say it’ll get though – I’m not so sure. Seven songs in and we get our first real contender to win the ESC this year. Whilst there are eight couples/duets in the contest this year, this is one of the top three (with Lithuania and Norway being the other two). A good double-hander from Elina and Stig will see them sail through to the final. It’s one of my top five of the year, probably top three. Our first slightly ethnic entry of the year – and it finds Macedonia on familiar ground, onto which “Autumn Leaves” are falling. I like it, and think it will get to the final- nothing else sounds like it in this semi, so that will help. Although I hear from Brian that the song has had a remix and so I might have to rethink. Bojana’s song has one of the more ‘heal the world’ sentiments from the crop of songs this year – Russia will be on similar ground later in this semi-final. This song is all about beauty coming from inside, and all that jazz. It’s kinda inspirational and uplifting lyrics might chime with some, but the track is another mash-up of styles and it builds oddly for me. Serbia sat the contest out last year, and failed to qualify in 2013. Not sure that they will again this year. But if the sentiment connects, then it might. Boggie (all too close to typing bogie there!) is also tickling our socially conscious buttons with “Wars For Nothing”. A breathless and light vocal, mixed with the folky-vibe might be a bit too subtle set against some of the more powerful songs. It was top five in the final for them last year – that won’t be the case in 2015. And the award for the best act this year goes to this lot – Anti Social Media! Great name. A familiar theme once again for this song, as you have heard its type before. I’m channelling McFly for this one. Nice harmonies, familiar melody and tempo. They have sharp haircuts and sharp suites, and I can’t see any reason why we don’t see this again on Saturday night. My dear friend and colleague, Ruxandra, has doubts that her home country will make it to the final this year. If they don’t it would be a major upset, as Romania are one of the ‘bankers’ each year. Well, they might need the diaspora vote from around Europe, because it’s not one of their best entries. We end the first semi-final in fighting spirit with the first of two songs called “Warrior” this week. 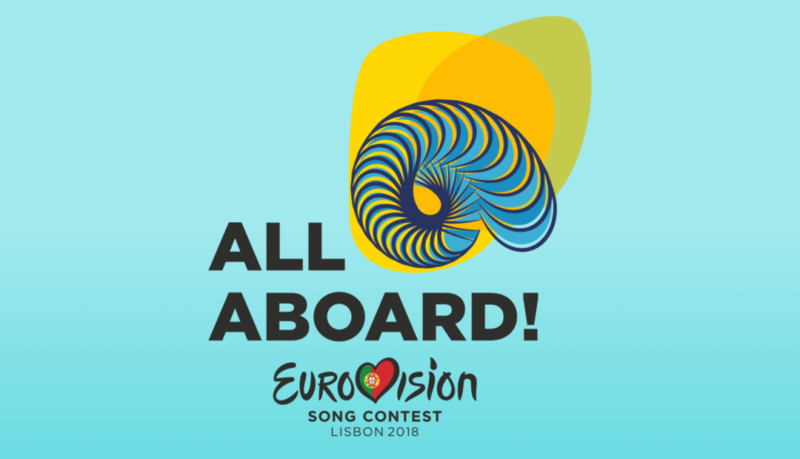 I actually prefer Malta’s effort on Thursday, but this is a spirited song and performance, and if it’s staged well then it should go through to the final on Saturday night. 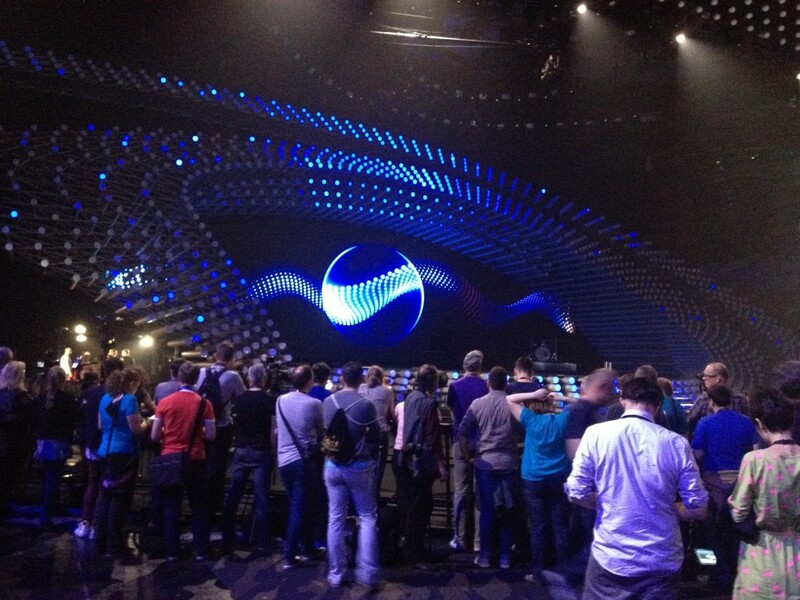 So, there you have it, the first batch of euro-hopefuls ready to entertain us all tonight. Later today (Tuesday) I will be at the press centre to watch the final rehearsal for tonight, so I’ll update my review based on what I have seen, and not just what I have heard, so check back later for the sights and sounds of ESC 2015. Your local euro-pundits will also meet later to do our ‘napkin of death’. That will determine who we think is going through and who we think is going home. Who will be on your list? Why not leave me a comment with your top ten!